Hasmukh Adhia says he sent the expensive gift to the government's toshakhana but has no explanation for why he did not order an investigation. New Delhi: In a revelation that places a question mark over the government’s willingness to take on businessmen trying to bend the system, Union finance secretary Hasmukh Adhia received two gold biscuits of 20 grams each from a mystery giver during Diwali in 2016 but neither he nor his minister, Arun Jaitley, sought to order an investigation into the identity and motive of the individual who evidently sought to influence him. Despite two years having passed, the identity of the giver is still unknown. The mystery gift was valued at around Rs 2 lakh for the two gold bars. Adhia was then holding the key office of revenue secretary. His importance in the establishment’s pecking order may be gauged by the fact that he was one of only a handful of individuals who was privy to Prime Minister Narendra Modi’s November 8, 2016 decision to demonetise high denomination notes. Adhia confirmed to The Wire that the mystery gold was sent to his residence in New Moti Bagh and claims that as he was not at home when it was delivered, he does not know the identity of the generous gift-giver. But instead of asking for a Central Bureau of Investigation inquiry into what could only be termed an attempt to ‘bribe and influence’ one of the most powerful bureaucrats on Raisina Hill, Adhia says he simply sent the gold bars to the government’s official toshakhana – a facility run by the Ministry of External Affairs where gifts above a certain value given to officials and ministers are meant to be deposited. Barely 24 hours before confirming receipt of the gold, Adhia had denied receiving an expensive gift from controversial billionaire jeweller Nirav Modi and sending it to the toshakhana, as this correspondent had been informed by well-placed sources. After reconfirming with its sources that a gift of gold had indeed been delivered to his house, The Wire asked Adhia two follow-up questions on March 7. One, if his office had submitted five gold bars post-Diwali to the toshakhana, and two, why his office did not mention who gifted the mystery gold. Diwali in 2016 fell on October 30. 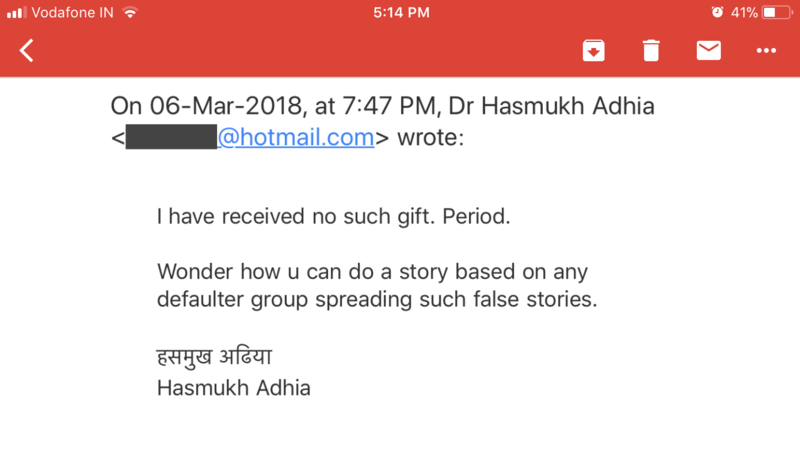 In an email response to these questions, reproduced in full, Adhia said it had always been his practice not to accept any expensive gifts during Diwali. “During the Diwali festival recently, I got certain gifts which are precious in nature and which cannot be accepted by me as per the Conduct Rules. Since they were delivered at my house in my absence, I could not even refuse to accept them. And it is difficult for me to identify who sent these gifts for me now. While Adhia has denied that the gold was gifted by diamond king Nirav Modi, the identity of the giver is still a mystery since no investigation was ordered. Curiously, the MEA, which maintains a complete online registry of gifts deposited in the toshakhana has no entry for Hasmukh Adhia for the corresponding period (October-December 2016) or even the next quarter. Asked about this discrepancy, Adhia confirmed that he had “deposited [the gifts] in [the] Toshakhana of [the] MEA” and that he has a “receipt of the same dated 07-11-2016 from them”. E.A.S. Sarma, a former expenditure secretary in the Union finance ministry told The Wire that “the least [Adhia] could have done is ordered an investigation into why the gift was sent and show the government’s anger against the sender”. Gold biscuits are not an ordinary gift, he added, and clearly the sender had an intent to bribe the officer, who was not holding an ordinary post. “The promoter of a private company gifting gold biscuits to a senior government officer, that too an officer dealing with taxation, is a serious matter. While such gifts are required to be surrendered to the government, it is equally important that a stern message is conveyed to all such individuals and companies that the government would not tolerate such instances in the future. Ordering an enquiry would have conveyed such a message. Not ordering an enquiry would have not only condoned the company promoter but also given the impression that private individuals could get away with such acts of malfeasance,” he said. Sarma added that if the person who sent the gift of gold to Adhia was not probed, it is likely that he was someone who wielded influence over the upper echelons of the government. Note: This article was updated to include Adhia saying that he has a receipt from the MEA’s toshakhana for the gifts he deposited.